Michael Smith will be back in the Posh starting line-up against Port Vale. Peterborough United manager Grant McCann is seeking a fast start to the League One fixture with Port Vale at the ABAX Stadium tomorrow (September 10). McCann felt Posh stood off Swindon too much in the first-half of last week’s 2-2 home draw. The three Posh deadline day signings. From left: Luke McGee, Nathan Oduwa and George Moncur: Photo: Joe Dent/theposh.com. McCann, who is expected to recall right-back Michael Smith to the starting line-up after a busy week for the Northern Irishman involving international duty and the birth of his first child, said: “We’ve put in two good shifts in a row with the exception of the first half against Swindon. “We gave them too much time on the ball and that won’t be happening tomorrow. We have a lot of energy in our side and it’s important we use it. Vale have started the season well, but they have struggled away from home so we must use that to our advantage. “Training’s been good this week as we haven’t had a midweek fixture. I deliberately didn’t organise an under 23 game either as I wanted a full week’s training with the whole squad and it went well. “Consistency of performance is what we are aiming for. It’s harder to get consistency with younger players, but our job is to improve them and that’s what we’ve been doing. Posh manager Grant McCann. Photo: Joe Dent/theposh.com. “It will be good to have Michael Smith’s knowhow and experience back into the side. The rest of the lads respect him greatly. It’s been hard on Hayden White to pick up an injury at the time he would have started in Michael’s place. Transfer deadline day loan signings Luke McGee, Nathan Oduwa and George Moncur will all be in the matchday squad and the latter must have a chance of starting after am impressive debut as a second-half substitute against Swindon. Who to leave out would be tricky for McCann as Moncur replaced Gwion Edwards last weekend after the Welshman had claimed his fourth goal of the season. McCann has revealed striker Shaquile Coulthirst could go on loan to a National League club before January. 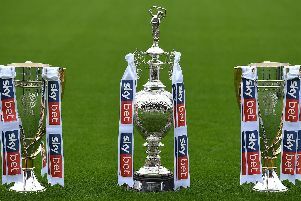 Football League clubs are not allowed to sign loan players until January, but players can still move into the fifth tier of English football. Coulthirst has fallen behind 17 year-old Deon Moore striker in the Posh pecking order. McCann added; I think Shaq is open to the idea. He’s suffered because of Lee Angol’s injury. The pair of them looked good together in the last two matches of last season, but now I can’t see him getting as much game time as Tom Nichols, Paul Taylor or Deon Moore.